After breakfast in Arusha, drive to Tarangire to discover the giant termite mounds and baobab trees of Tarangire. This park is famous for its large elephant population, scenery and diversity of birdlife. Overnight at Tarangire Safari Lodge.Tarangire's wildlife includes elephant, lion, giraffe, warthog, ostrich, impala and baboon. Leave the lodge at 7am for an early morning game drive. Return to the lodge at 11am for an afternoon break. Eat lunch at the lodge and proceed on a second game drive from 3pm until 6:30pm. 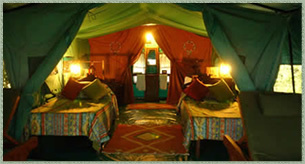 Return to Tarangire Safari Lodge at 6:30pm for dinner and overnight. Leave the lodge at 9am for Serengeti National Park. Pass through Ngorongoro Conservation Area along the way, pausing to view the Crater. As you drive to the lodge, game drive along the way viewing the park's resident and migratory animals. Overnight at Serengeti Serena Lodge, located in the heart of the Serengeti.Species commonly seen in the Serengeti include wildebeest, cheetah, zebra, lion, giraffe, impala, topi, and leopard. The Serengeti is also home to more than 540 species of birds. Go on an early morning game drive at 6:30am. Return to the lodge for an early lunch. After lunch, proceed to Mbuzi Mawe for dinner and overnight. By July, the migration typically splits into several groups and moves toward the northern and western areas of the park. Dinner and overnight at Mbuzi Mawe. Leave the lodge at 6:30am for an early morning game drive. Return to the lodge at 11am for lunch. Spend the hottest hours of the day relaxing at the lodge. Go on a second game drive from 3pm until 6:30pm. Return to Mbuzi Mawe for dinner and overnight. At 7am, leave the campsite for a six-hour game drive in the crater. The largest unbroken caldera in the world, Ngorongoro has an area of 260 kilometers and a depth of 610 meters. The crater provides a protected habitat for thousands of mammals and birds. At 2pm, leave the Crater to return to Arusha.